Fixed an issue with blurry icons. Honeycomb 3.2+ and ICS: New 7" tablet-specific layout. Pre-Honeycomb: Improved quantity and cuts dialogs to require fewer taps. This update is now available on the Google Play Store. Now available on Google Play Store. Added support for specifying a total order price. Completely new, easier to use, dialog-driven interface for selecting pizza characteristics. 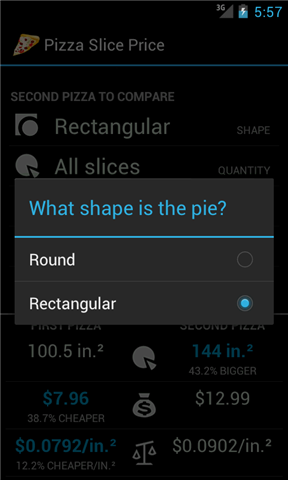 Honeycomb and ICS: One-touch no-typing dialog-driven interface for selecting pizza characteristics. Honeycomb and ICS: Holo theme support. Honeycomb 3.2+ and ICS: New tablet-specific layout. 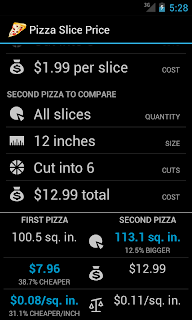 Fixed a bug introduced in version 1.1 where size was miscalculated. The new app is now available on the Google Play Store. 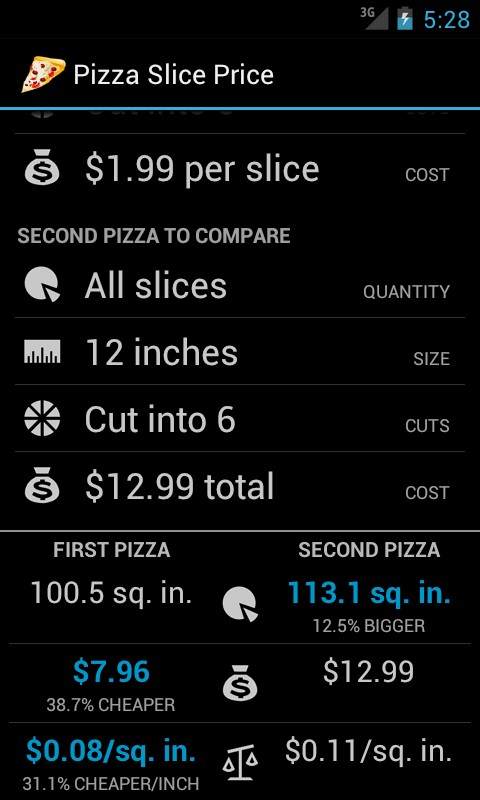 Note that I have opted to release this version of Pizza Slice Price as a new app. Although the previous version of the app was downloaded nearly 2,000 times, it received very low ratings and had a retention rate below 10%. Because this app has more features and a different, improved layout, and the Google Play Store does not support ratings-by-version, I'm giving this app a fresh start. The old version of the app will continue to be available on the Google Play Store through the end of the month.